Wicklow Hospice Foundation has exceeded their €3million fundraising target and will now proceed to apply for planning permission for the long-awaited Hospice facility at their chosen site at Magheramore near Brittas Bay. 1,000 people turned out today for the landmark announcement at the seaside site, which was donated to the foundation by the Columban sisters. Foundation Patron and Wicklow resident Daniel Day Lewis could not make an appearance on the day, however a recent video of Daniel talking about the importance of the facility from the Magheramore site was broadcast to those gathered today and received a tremendous reception. Patrons Chris De Burgh, Shane Byrne and Phelim Drew were on hand to welcome today’s landmark announcement. The long-awaited Wicklow Hospice Facility was expected to receive the green light from the HSE in 2012, however the economic downturn meant the facility was put on hold. The HSE began a new evaluation process of sites in Wicklow and has now narrowed it down to three sites. 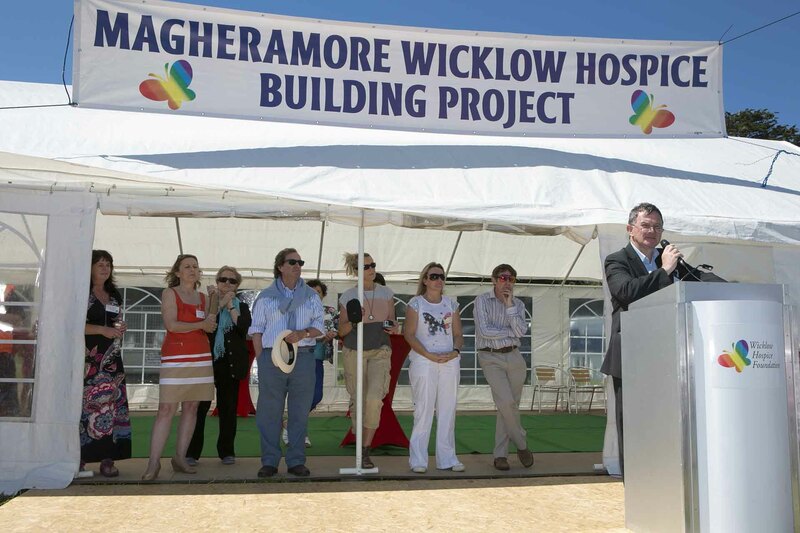 A decision on the site is now imminent and the Wicklow Hospice Foundation has decided to proceed with planning for the Magheramore site, so they can hit the ground running with building as soon as the green light has been given. Daniel Day Lewis has publicly said that the Magheramore site was the site they would build on, talking about his own experience of his mother passing away in a Cottage Hospital in the UK. He said the quality of the environment was crucial. The American Ireland Fund, who have assisted the foundation with reaching the €3 million fundraising target have expressed their delight at the news that everything is in place for the HSE to now build the new facility. CEO of the American Ireland Fund, Kieran McLoughlin welcomed today’s announcement describing it as a testament to the power of philanthropy. Evanne Cahill, Chair of Fundraising at Wicklow Hospice Foundation says the organisation is overwhelmed with what has been achieved.